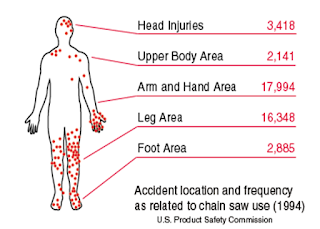 The chain saw is one of the most efficient, productive, and dangerous portable power tools used in any industry. If you learn to operate it properly and maintain the saw in good working condition, you will avoid injury as well as be more productive. •Chain saws are a great tool for landscapers and arborists. •Their powerful motors cut through heavy trunks, branches, and brush quickly and easily. •However, that power also brings danger. 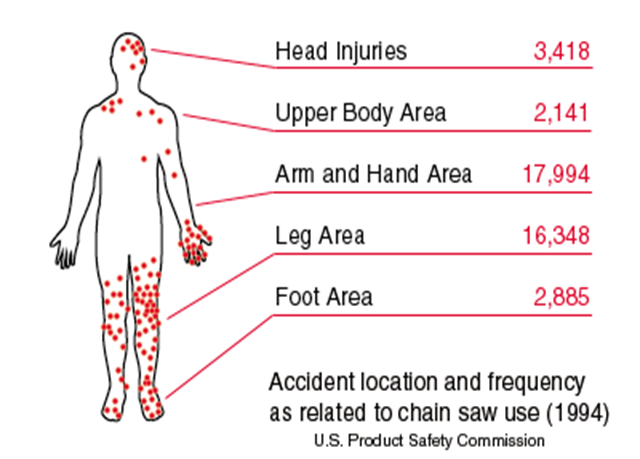 •Safe practices are critical in using chain saws. Notice how most injuries occur on the lower left leg and the left arm.